This fall, Margot Fassler, Director of SMND, and the Keough Hesburgh Professor of Music History and Liturgy, was invited to give three keynote presentations. These formal presentations include her lecture “Within/Without: The Liturgical Voices of Women Religious in the Later Middle Ages,” for the Reichenau-Tagung des Konstanzer Arbeitskreises für mittelalterliche Geschichte. 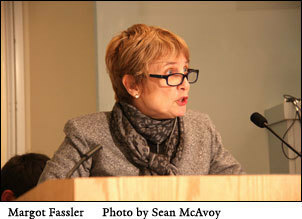 The following week, Fassler presented a keynote on the liturgical practices of the Augustinian canons of St. Victor in the twelfth century at “A Sacrifice of Praise: Liturgy, Prayer, and Hymnody at the Center of Faith and Life,” the 42nd Patristic, Medieval, and Renaissance StudiesConference, at Villanova University. Next, on November 30, Fassler travels to Binghamton University to give the Bernardo Lecture on the subject of Hildegard’s cosmology, in conjunction with scenes from the model of creation and cosmos by Fassler and digital artist Christian Jara. This week on November 16, Fassler will give a lecture at Contraffare an international symposium in Basil, Switzerland, but she will do so on Skype, a first, with hard copy sent by email, just in case! Next year Fassler will be teaching two courses in the Program in Sacred Music this coming year, “Worship and Music in the USA” and a seminar on Hildegard of Bingen. Originally published by Matt Haines at sacredmusic.nd.edu on November 16, 2017.